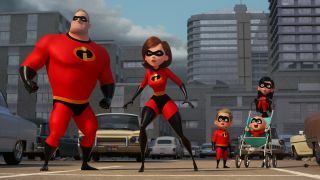 It’s been a long time coming, but Pixar favourite The Incredibles is finally getting a sequel this summer, 14 years after the super-family were last seen about to face of with new villain the Underminer. Incredibles 2 picks up exactly where that film left off, but this time out, Helen (AKA Elastigirl) will be at the forefront of the action, when she’s picked to be the lead on a mysterious new campaign to put supers back in the spotlight. Which means, Bob (AKA Mr Incredible) is left to deal with things on the home front while Elastigirl is out fighting crime. For much more on Incredibles 2 – which opens in the US on June 15 and in the UK on July 13 – pick up a copy of the latest issue of Total Film magazine, which is on sale from Friday June 1 and comes with a special collectable Pixar supplement. And if you never want to miss an issue of Total Film (or a special supplement), why not subscribe? You’ll save money on the cover price, and you’ll get every issue before it hits shelves. Pop on over to My Favourite Magazines for more info.